I have stayed for five months in Indonesia’s main tourism destination, BALI. Five months is not enough to be an expert on this island. 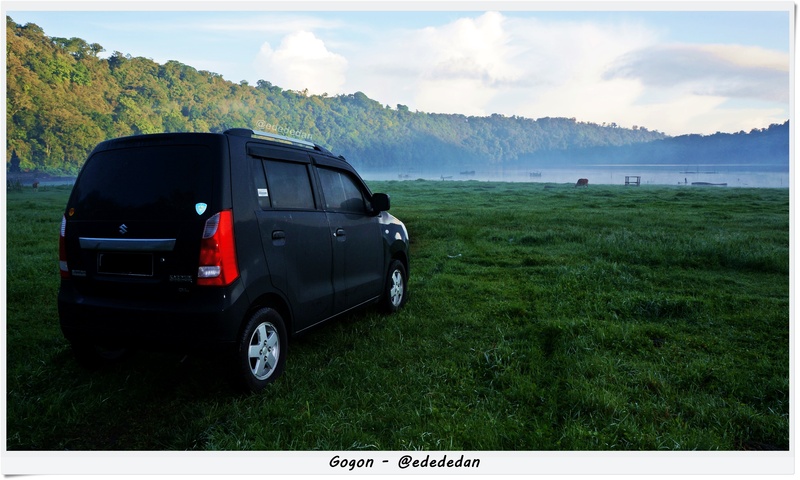 At least, I have tried to explore Bali either with friends or alone, but mostly I did some road trips with my best friend Gogon. You know, Bali is home to many tourist destinations and visitors have many ways to easily explore the island to discover them. The 5,780 square kilometers area of Bali is offering various ways to explore the island. For me, one of the most interesting options to ultimately enjoy your vacation in Bali is by taking a road trip. Very flexible! I can even have a one-day road trip from one side to other side of the island. For instance, I can easily leave Denpasar at dawn to watch the playful dolphins off Lovina Beach at sunrise, continue my journey to Bedugul or Kintamani to explore the breathtaking landscapes, then drive back to Denpasar on a one­-day road trip. For a longer road trip, I can stay overnight in one area and continue the adventure to the other side of the island the next day. But, as always, take time to prepare and plan well before you go, such as choosing your exact destinations and pit stops, calculating your timing for the trip and checking the safety of your vehicle. Besides I always preparing fascinating songs on my playlist before the road trip. Here are other tips that you should consider to make sure you have a fun, yet safe, journey. They are based on my experiences. We can say the center of tourist attractions situated in the southern part of Bali. You can see various types of beaches with their own characters from Tanah Lot to Uluwatu, from Nusa Dua to Sanur asides with the Seminyak, Kuta and Legian that offered the modern city life in Bali. Meanwhile, the Ubud area is also offering the cultural energy and enchanting atmosphere of traditional Balinese life asides with the breath-taking landscapes. But they are only a quarter of the island. There are many more breathtaking places of nature waiting for you outside the south of Bali. For example, you can make your way from Denpasar to Bali Barat National Park via Jl. Raya Denpasar Gilimanuk and make pit stops at Gede Perancak Temple and Rambut Siwi Temple in Negara. Or opt to go to the northern part of Bali via Bedugul, where you will find the splendid trio lakes of Beratan, Buyan and Tamblingan in Bedugul, and the amazing waterfalls of Gitgit, Singsing, Alingaling and Melanting, and other hidden waterfalls that you might never heard of, in Singaraja. You can also enjoy the breathtaking view of Batur Lake and Mount Batur if you are heading north from Ubud. Dolphin watching off Lovina Beach at sunrise is also a must ­do attraction that you will discover in the northern part of Bali. For divers, you might want to consider planning a road trip to the eastern part of Bali. A number of highly recommended dive spots are there, such as Padangbai, Candidasa, Amed and Tulamben. Afterwards, continue your trip to Menjangan island via Singaraja to enjoy some more underwater activities. As an island, most of Bali has tropical weather with warm temperatures. This is true when you are on a beach or taking a road trip along the main western, southern, eastern and northern coast. But if you are passing through the central part of the island, from the south to the north, you will immediately feel the temperatures getting colder, especially at night, in the higher areas such as Kintamani and Bedugul. To anticipate this temperature difference, you will need to bring a jacket or warmer clothes. You might want to bring a flask of hot coffee or tea as well to be easily sipped whenever you need it. Preparing a stock of food in the car is also a great idea as you will not stumble upon many convenience stores, food stalls or restaurants at night. Besides the cliffs in Uluwatu, the roads in the southern part of Bali to the west are mostly flat. The land is getting higher and become rather steep and twisty when you go further up, to the north and east. At some points in Bedugul, the roads can even be frequently covered in thick fog or rain. If you are heading to Gilimanuk or Padangbai, you should also prepare for narrow roads and a number of huge trucks heading to the nearby ports to cross the strait. These two situations will require a self-confident driver than an off-road vehicle. 4. GPS feature on your smartphone is very useful! 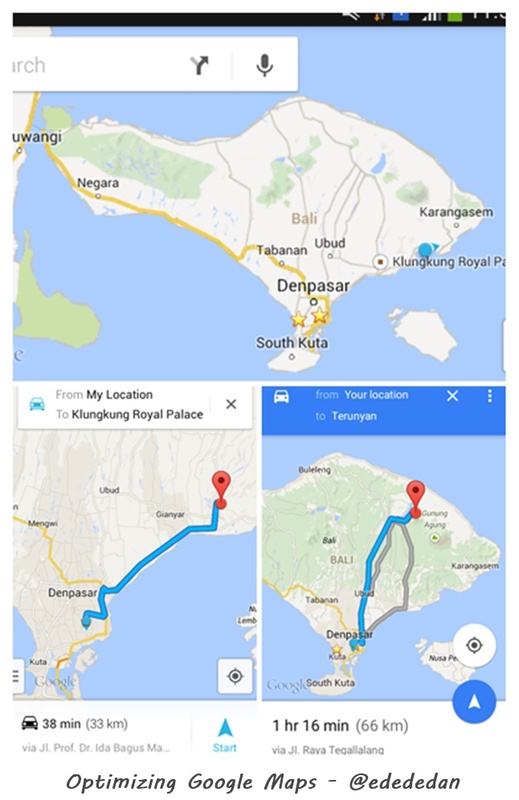 Another advantage of having a road trip in Bali is you can easily rely on your smartphone to navigate on your trip. The simplest way is by using the Google Maps feature on your phone. This online map application is not only useful in downtown areas, such as Seminyak and Kuta, but also a great guide while you explore other parts of the island, especially the touristy destinations. Use your GPS­-enabled smartphone and map app to navigate, track, or save your current spot if you don’t have a dedicated GPS device. But bear in mind, not all apps are accessible while offline. If you tend to go to places with no access to the internet, it’s best to pick up apps like Here Maps, which is free to use and available for Windows Phone and Android. But if you have an iPhone, Garmin or Navigon is your best pick. Some people say that the art of a great road trip is to get lost and face an unexpected experience. This can also be applied to your journey in Bali. While traveling in Bedugul, opt to leave the main road after Beratan Lake and head to the lake areas of Buyan and Tamblingan. As these lakes are situated side by side, you can easily enjoy the view from the top of the hills while sipping coffee and eating instant noodles at a nearby food stall or cafe. If you keep following the steep road from Buyan, it will take you to the Tamblingan Lake area. Though the thick mist and the narrowing road might leave you with doubts about continuing the trip and it seems like you are getting lost, do not worry as you are indeed heading to the lake’s entrance gate. Park your car in the parking lot and then walk to the edge of the lake to enjoy the view. The thicker the fog covering the area, the more beautiful the scenery you will get to admire around the lake. I remember our road trip to Tamblingan lake. We were arrived at 00.30 a.m and staying at one of the local’s home (we made the appointment with him before). Of course we saw nothing during that time. My friend who drove the car asked me whether we continue the trip following the guy we just met. We decided to continue the trip passing the bumpy and narrowing road. As our guide stop, we parked the car right next to his house. The picture bellow is the view I saw around Tamblingan lake the next morning when I woke up. I wrote this post and originally published on The Jakarta Post Travel. Hohohoho… leave the main roads. Woohoo! This entry was posted on January 12, 2015 by Edna Tarigan in Bali, Indonesia, Tips, Travel and tagged Bali, Indonesia, Road trip.